Part of the Venture Marketing Group, the What Career Live website promotes exhibitions for 15-19-year-old school leavers who are weighing up their options regarding universities or apprenticeships. The existing website was over ten years old and in need of updating, both on the front-end and back-end of the site. The team at What Career Live needed an online presence that engaged their audience and offered a more accessible platform for their growing bank of content. The original website received tens of thousands of visitors every month, with the majority of them using mobile devices. Since the site wasn’t built using a responsive website design, these mobile visitors weren’t getting the best user experience. The What-Career-Live staff who managed the back-end of the website weren’t getting a great experience either. 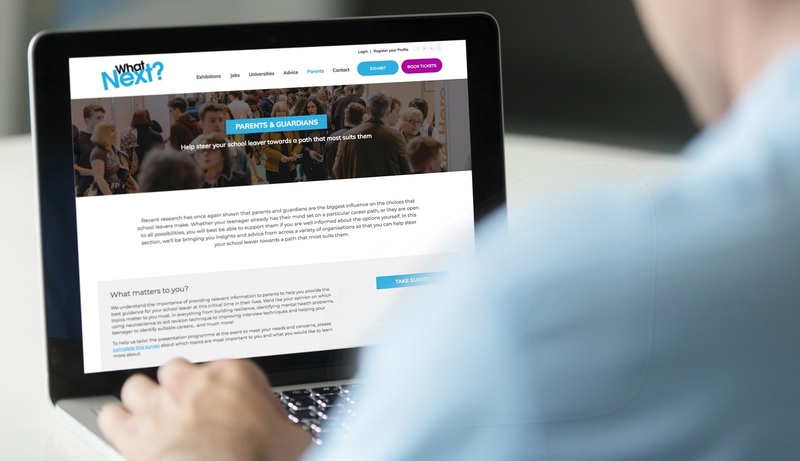 They needed to be able to manage exhibitor and client profiles, update content and images in blogs and news articles, as well as edit information about exhibitions, conferences and job vacancies. The existing site made it difficult to do this. Since our content management system, thinkCMS, is built on a responsive design, it can be accessed on any device, whether a smartphone or tablet. Given the young target market, the new website needed to be fast, efficient and user-friendly. As well as both the front and back-end displaying well on mobile devices, the user journey and UX design of the site was vital. With a mixture of 15-9 year-olds, parents and teachers visiting the site, it needed to offer intuitive navigation that made it easy for people to find the information they needed. The new What Career Live website allows visitors to explore a wide selection of job vacancies, apprenticeship opportunities, available employers and potential universities. Since this is a big decision, we made it easy for users to filter their job search results by industry sector and location. Specific areas focused on international students and university open days give visitors plenty of options to choose from. By creating their own account visitors could save jobs and searches, apply online, set up job alerts, access their job history, upload their CV, and update their details. Knowing that too much choice can sometimes be daunting, it was important that What Career Live offered help and advice on the many opportunities open to school leavers. The Advice section of the website features articles and guides that can be filtered based on a number of colour-coded categories. Visitors can also download the latest edition of What Next? Magazine. As well as targeting students, the site was also a resource for parents researching the options available to their children as they reached school-leaving age. Here, they could access articles specifically targeted at parents and take a survey that allowed What Career Live to improve the support they provide parents. The What Career Live website needed to give universities and businesses the opportunity to create their own profile pages as well as exhibit at the various exhibitions and conferences hosted across the UK. Specific exhibition pages for the London, Liverpool and Birmingham events highlighted what students could expect when they came along and gave them the chance to book tickets. An Exhibit section of the site demonstrated to businesses and universities the benefits of featuring at the events, with the chance to inquire about exhibiting or download a brochure for more information. "This was the first project we worked with UpriseVSI on and, based on the strength of the results, it became the first of many. We were really impressed with their attention to detail and care throughout the project delivery and have seen our site go from strength to strength as a result."